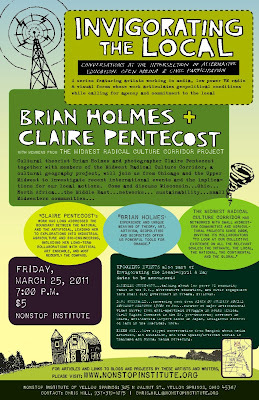 Cultural critic and blogger BRIAN HOLMES, photographer and writer CLAIRE PENTECOST, and other artists from the MIDWEST RADICAL CULTURAL CORRIDOR, a cultural geography project, will be speaking on Friday, March 25, as part of a spring series at Nonstop called INVIGORATING THE LOCAL—Conversations at the Intersection of Alternative Education, Open Media & Civic Participation. 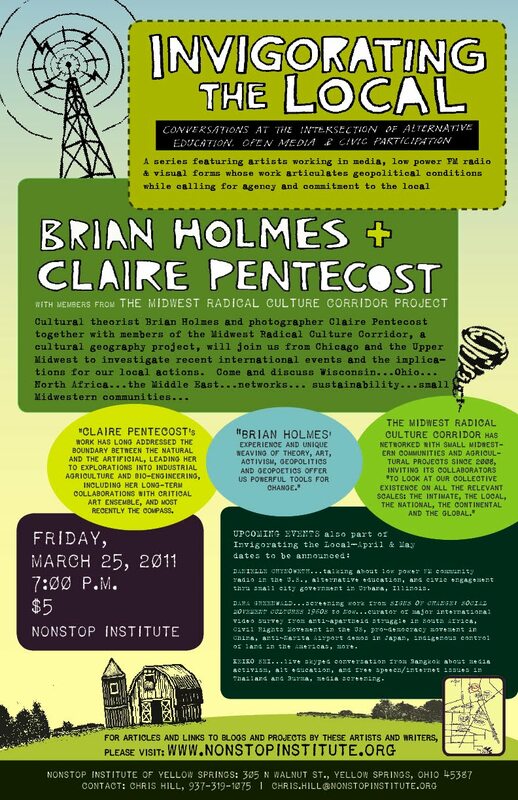 The presentation by Holmes, Pentecost and the Midwest Radical Cultural Corridor project will articulate geopolitical conditions while calling for agency and commitment to the local. Come and discuss recent events in Wisconsin and Ohio, networks, sustainability, small Midwestern communities, and events in North Africa and the Middle East. Brian Holmes’ blog Continental Drift and recent book Escape the Overcode: Activism Art in the Control Society (2009) have been described as “a unique weaving of theory, art, activism, geopolitics and geopoetics that offers us powerful tools for change.” Claire Pentecost’s work has long addressed the boundary between the natural and the artificial, leading her to explorations into industrial agriculture and bio-engineering, including her long-term collaborations with the arts collective Critical Art Ensemble (author of The Electronic Disturbance, 1994). And the Midwest Radical Cultural Corridor has networked with small communities in the midwest—Illinois, Wisconsin, Iowa, Indiana, and now Ohio—inviting its collaborators “to look at our collective existence on all the relevant scales: the intimate, the local, the national, the continental, and the global.” See nonstopinstitute.org for links to projects and publications by Holmes, Pentecost, and Radical Midwest Cultural Corridor members.